Tarte is continuing their birthday sale with a new deal today! 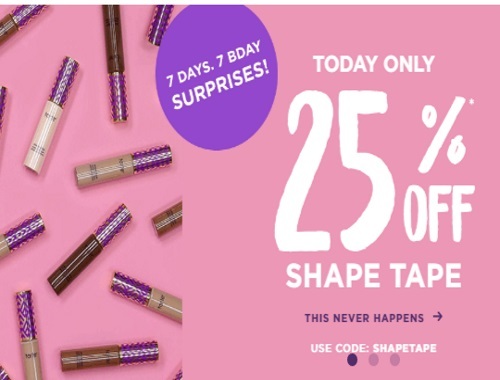 Get 25% off Shape Tape concealer today only! This never happens, their popular concealer is always excluded from promotions, so grab this if you are interested. I have this concealer in 4 different colours, I love this stuff! Enter the promo code SHAPETAPE at checkout to get the discount. Offer is valid today only, Tuesday October 17, 2017. Click here to browse Tarte Cosmetics.